Removing faulty cases: the right rejector for all cases. 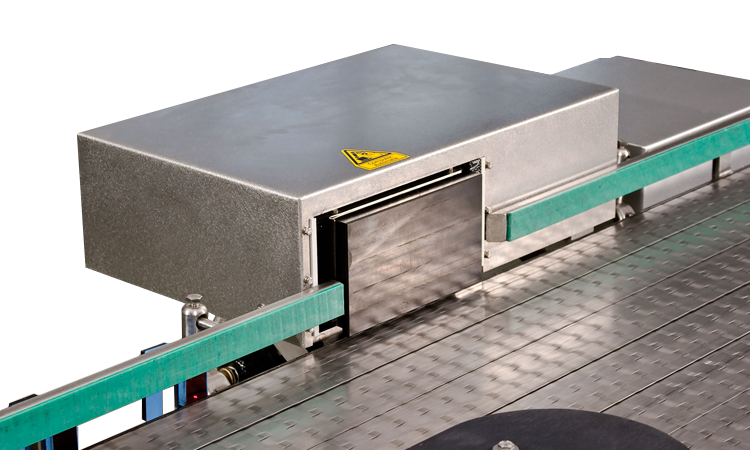 Discharging, rejecting and distributing: HEUFT rejection systems for outer packaging remove faulty crates, cardboard boxes, trays or shrink wrap packages reliably from the production flow. They achieve maximum performance, optimally matched to their respective task, with regard to precision and carefulness. The HEUFT xcase guarantees brand purity along the line. Its load-dependent control system which adapts the force of the rejection impact to the weight of each individual case removes non-brand and faulty cases smoothly from the line. Outer packaging of varying weights is therefore always rejected an equal distance. The HEUFT xtray removes damaged or faulty full trays from the line. Three rejection fingers, which are on a sledge installed under the roller conveyor, are extended for this purpose. Trays can also be distributed onto several lanes if several of these intelligent case rejectors are lined up next to each other. The HEUFT maxi-flip rejects empty, half-full or completely full cases an equal distance onto parallel conveyor chains. Its rejection segment is activated for a longer time for heavy cases or cardboard boxes than for lighter ones. A complex mechanical changeover for different types of cases is not necessary. The HEUFT maxi-laner is the space-saving alternative to the HEUFT maxi-flip. The compact system which is installed directly above the conveyor is also impressive with a load-dependent control system: it always rejects cases of different masses and varying weights equally. Distributing onto three lanes is also possible with the HEUFT maxi-laner.